The boyfriend and I decided to go on a date today. It was mostly just a movie, but we also really wanted to do dinner. Sometimes the hardest part of a date is deciding where to eat. We drove around the entire complex and finally decided on a place we have both been before, but I probably haven’t been there in five years or more. I have to say, it was pretty terrible. The restaurant I remembered from five years ago is not the same place we ate at tonight, despite the name on the sign. My boyfriend is the guy who will eat all of his food, even if he is miserable afterwards. We both left a lot of food on the table. He even said that if he’s leaving food on the table, that means it was really bad. Thank God the movie was the nostalgia I knew it would be. I was the person who wanted to see Star Wars the Force Awakens on opening weekend and everyone scoffed at me that it would be insanely busy, or it wasn’t worth it. And yet, everyone else saw it opening weekend except for me and the boyfriend. We finally had a few free hours today and two free tickets. It was amazing! I loved everything about it. I loved that it had some of the original characters and I fell in love with all the new ones. I particularly loved that Rey was a strong female character who ended up saving Finn’s life on multiple occasions, rather than the reverse. It could have come across as forced, but I don’t think it did. Happy New Year to my WordPress family! I hope you had an amazing 2015 and I’m raising my glass to you and the start of another amazing year. 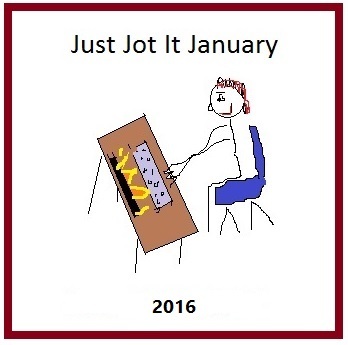 Just Jot It January is hosted by Linda G Hill. The prompt word today was persnickety, just in case you didn’t catch it. I saw Star Wars with my brothers last week. Loved it. I heard a lot of people, reviewers didn’t, but I don’t know what their problem was. It was great. Happy 2016 to you. Me either. I just go and write one of my own. I talk about why I love it and what it means to me. I am yet to watch Star Wars! But glad there was a good way to end your date after the not so good meal. Happy 2016. Thank you Willow! Happy New Year! Loved your post. What a great year 2015 was. Look forward to your amazing post in this coming new year!! Love you sweet girl!! You are very welcome. Your writings are very entertaining and I love them. Glad to hear the movie made the date worth it! Happy New Year to you and yours, Helen. 😀 Can’t wait for the news to come!